Hydrovac trucks are widely used in the hydro excavation process because of the gentle footprint they leave compared to backhoes and other, more evasive excavation methods. Hydrovacs are used to excavate all types of materials such as clay, sand, ice, and gravel. EdenFlo’s hydrovac service makes the excavation process non-destructive, smooth, and efficient. Underground fixtures are not damaged in the process. Hydrovac service involves the use of pressurized water and vacuum to remove unwanted debris from the work site. Hydrovac trucks have two main components which empower the excavation process. 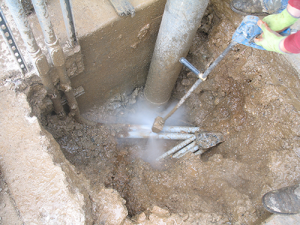 First, high-pressure jets which loosen the material being excavated. Second, a strong vacuum hose pulls out all the debris which is transferred to a large debris holding tank. If you require the best excavation services think of EdenFlo. We service all areas of the lower mainland including Vancouver, Delta, Surrey, Langley, White Rock, Richmond, Lions Bay and Abbotsford. This entry was posted in Hydrovac service and tagged Abbotsford Hydro Excavation, Abbotsford Hydrovac service, Delta hydro excavation, hydro excavation services Surrey, hydro excavation white rock, hydrovac services Lions Bay, Langley hydro excavation service, langley hydrovac service, Lions bay hydro excavation service, Richmond hydro excavation, Richmond Hydrovac service, surrey hydro excavation service, Surrey Hydrovac service, Vancouver Hydro excavation, Vancouver Hydrovac service, White Rock hydrovac service on July 29, 2017 by Edenflo.